Club Penguin Cheats by Mimo777 Club Penguin Cheats by Mimo777: Club Penguin Dead Domain? UPDATED, AGAIN! Social Media website Mashable.com posted this story and it looks like according to then Club Penguin's domain "glitch" was that the FORGOT TO UPDATE THEIR DOMAIN NAME. Thx, guyew. So are you seeing the FAIL Clown? UPDATE: Club Penguin is available for most players again. But we have heard that some of you can’t see it yet. Thanks for letting us know. The team is still working on fixing any issues with the site. Thanks for your continued patience with this. 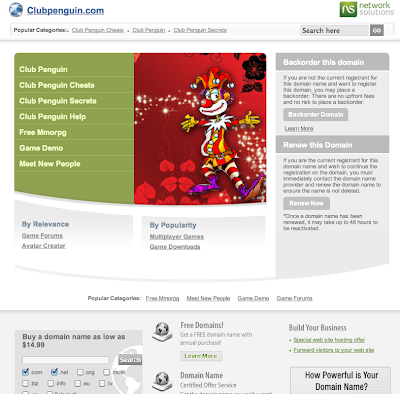 As some of you heard, Club Penguin’s domain name (clubpenguin.com) had a technical glitch this weekend. The technical glitch has been fixed, but it will take some time for the site to appear as it should around the world. Remember — when in doubt, talk to a parent or guardian if something looks suspicious to you. This can't be good for them! Especially during one of the biggest parties of the year! They obviously forgot to renew their domain, but really? How can that happen? UPDATE: Some are reporting its back up. But it's not for us. Keep us posted to what you get. In the meantime play MIMOGAMES! Yea!! What's up with this??? Are they going to fix it soon??? I don't know what happened but I find it to be pretty funny. This is a quite a mistake. I think they forgot to renew the domain. Beacouse of this i hope that the Music Jam should end at 26. They said on the community blog they had forgotten to renew the domain name (possibly because they were busy with the Music Jam) but that they renewed it now and it might take a while to return back how it was before. In other words: yes, don't worry, it's coming back to normal. Also the FAIL is that someone else can buy the domain for 64$. That means Disney will have much problems! I know its funny how did they forget? If i didnt waste my $ on something else i could have buyed the domain. I wonder what would disney offer me to give it back ..
is that a "major epic FAIL" that i smell? My problem in almost the same.Instead a clown theres a guy that plays golf.I must meet Penguin bandbefore Music Jam ends!I need the background,Mimo!I need it!! :O This is weirdz. When I went on it, it had a picture of a guy playing golf! my friend said on the clubpenguin site it was talking about how the domain was having problems but is not fixed in some parts not all over the world. my friend is in the united states right now and in in europe and it is not working for me. what a complete faaillll!!!!! how could u just 4get 2 pay 4 ur domain like reallyy?!??!?!?! lololol!!! This is crazy! I want club penguin not some clown! Hey Mimo i called cp and they said Cp will be up in a few hours amd they need to renew their name. The same happened to me, but I got a golfing site. it's back up now. This is so annoying! There's nothing else to do today and it came up to this weird golf site. This is definetly a mistake. I would like to report that I brought up the Club Penguin website for a few moments but it redirected back again. I hope that this is fixed soon. UK is working fine. Sorry for you guys. I find it funny how they think Music Jam is more important than renewing the domain. It actually works on me! If you ring Club Penguin up and if you're a member, Club Penguin will give you another week of membership! Pretty awesome! wow. Really sad. Of all the things, clubpenguin forgot to pay their domain. They should really have auto renew on. This could be really annoying for EVERYONE. my penguin i havent been on for days so today i was kinda freaked out cause i couldnt get on! LOL HOW DOES DISNEY FORGET TO PAY THIER DOMAIN? EPIC FAIL!!!!!!!!! wow... so lame. disney has ruined cp so they cant even get on. The more you quote Hannah Montannah, the more i want to rip my hair out. MIMO IT SAID ON THE THINGS TO COME BLACK OUT 2 WEEKS! OH NO! looks like CP forgot to pay their membership ROFL! ive been trying on two computers since 5 am and only my bro can get on on his when he tried, do they do one computer at a time? if i didnt read this blog,id be sooo stuck rite now! i hoope they fix the glitch! The golfer picture is just random. I don't get what it's suppose 2 mean. So that's what happened!! I tried to get this morning, and the creepy clown showed up. (I honestly have clownaphobia whenever I see one... o-e) I asked my mom if I was doing something wrong. She said that the website was probably down. Then now I asked my sister, and she googled why it didn't worked and we found out on Yahoo! answers. I'm sure if someone knew about this, it would also be on this site. So I quickly came here after, and well, this is what happened to Club Penguin! 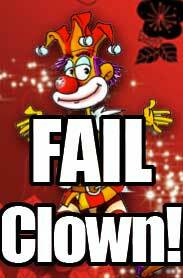 Is there really a FAIL clown? It's still not working Mimo!!!!! When is your next party? WHOOPS! 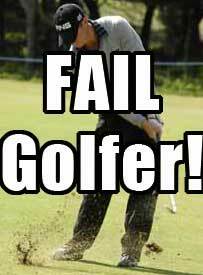 Sorry, Meant to say, is there really a FAIL Golfer? sorry about that. Unfortunately, it's still not working for me. I keep getting the "Fail Clown", as you called it. this is why i stoped playing clubpenguin DISNEY! Wow that is crazy! I am on my iPod right now and I went to check and there is a new iPhone version of clubpenguin.com!! :D Sadly all it says is "visit our site on a computer to discover more." it's still cool though! Yeah. This Morning I Happily Went To Club Penguin. To My Suprise, It Just Gave Me a Darn Clown!!!!! Its A Bad Reflect On Disney.But They Will Fix It! 3 Days Without Cp...I Can Live With It! CP is not back to me... (June 21st 2011, 04:17 AM, GMT). Me too it's just slow. 2 words to describe the situation for that worker who should of renewed it....PINK SLIP! Who does that!?!? Coo Coo brain. I have it. What's up with you guys? AHHH I was supposed to meet my mates on CP today. AHHHH. Why Disney, Why???? I thought this was happening only with me until I came here. ROFL ROFL. At first when I was trying to go to Clubpenguin.com I thought I typed it in wrong. Apparently not. The first website I thought to go to to see what was going on was of course, Mimo777's blog. Another Cp epic fail. Of course. I got up early this morning very excited to play clubpenguin. At first I thought I typed it in wrong. I checked to make sure, and my second thought was, dude, Clubpenguin shut down! But then I thought to come to Mimo777's blog. Then when I figured out they just didn't pay their domain, I calmed down just a little. Thanks Mimo777!!! I don't know if the owner of this site knows but i know a little secret: you can play drums with maracas. I don´t know if Mimo777 knows, but I know a little secret: You can play drums with maracas. At least right now at the lighthouse. I was checking out Club Penguin yesterday and it came up with the FAIL GOLFER! I was like, "What is this nonsense, did I go to the wrong site?" Haha, imagine if someone bought the domain with their money, who knows what they'll do to cp. I checked today and it's working fine. YAY! I'm pretty sure CP is gonna extend Music Jam or they're gonna cthrow a whole reoping party! I really want it to work again! Clubpenguin is back on both my computers. If you read what Happy77 said, they are working to get it back up. Also, on the domain website, it says that updating may take 48 hours. Ill be mad if it wont work today, cus then i missed chance to meet Cadence. MIMO MIMO it works for me i live in canada and it works! of coure cp base is in B.C. so i guess they wanted there country fixed first "eh"
WHOOP WHOOP! ITS BACK 4 ME!!!! It states right in the corner that it would take up to 48 hours for it to be ractivated again. To me is back up. I heard if you call them and you need to be woried and maymbe just maybe you got 1 week free membership. Mimo777 is clubpenguin working for you? You can comment or post the answer on you blog some people might want to know ok? I think that Happy77 is lieing! I just check CP it worked for me! But when i refreshed the page it didnt work ! I can't even go to the homepage, before, it let me go to the main page and the domain renewal site came up when I hit "play". Now the website just comes up like that whenever I put it in. And on my laptop, I was able to hit PLAY yesterday without the site coming up, although the Start up/login screen wouldn't load, it was just blue. IT'S CARL'S FAULT, I TELL YOU! HE INVADED! CARL IS THE REAL CRIMINAL, NOT HERBERT! OMG! Mimo its Mrs Lamaine and we went out to eat just now and on the way home I used my moms droid x 2 to go see if clubpenguin was working. So anyways clubpenguin is working only on smartphones! How lame is that! CP still will NOT work for me and im in the U.S.! GAAAAAAAAH! Now it is saying error on page! What happened?! ps.wats with all the gliches cp? I still dont have cp! I always get the crazy clown. I AM PAYING FOR MEMBERSHIP. I would like my deal fulfilled. do they know that there are 327.985.265.117.990.092 people that want to play club penguin for the music jam but NO they are scared to make a bad impression on themselves by saying its a bug!!! When is it gonna get to california! In Portugal the same, is not working. its alright in the uk over here mimo! OMG club penguin is working for me!!!!!!!!!!!! :):):):):):):):):):)!!!!!!!!!!! I was able to go to the home page on my first try. Hah! That's because they spend all their time thinking on what to make Member's Only.